Molly Caro May grew up as part of a nomadic family, one proud of their international sensibilities, a tribe that never settled in one place for very long. Growing up moving from foreign country to foreign country, just like her father and grandfather, she became attached to her identity as a global woman from nowhere. But, with Molly on the verge of turning thirty years old, everything changes. 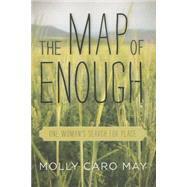 In The Map of Enough, Molly and her fiancé Chris suddenly move to 107 acres in Montana, land her family owns but rarely visits, with the idea of staying for only a year. surrounded by tall grass, deep woods, and the presence of predators, the young couple starts the challenging and often messy process of building a traditional Mongolian yurt from scratch. They finally finish just on the cusp of winter, in a snowstorm with temperatures below zero degrees. For Molly it is her first real home, yet a nomadic one, meant to be disassembled and moved at will. Yurt life exposes the couple to nature, to the elements, to the wildlife all around them. It also feels contrary to the modern world, and this triggers in Molly an exploration of what home means to the emergent generation. In today’s age, have globalization and technology taught us that something better, the next best thing, is always out there? How does any young adult establish roots, and how do we decide what kind of life we want to lead? How much, ever, is enough? Molly Caro May is a graduate of Middlebury College, and has worked as a teacher, artist’s model, apple and cherry picker, lab assistant to a clinical herbalist, barista in a seaside town, opera caterer, field assistant to a frog biologist, conservation program developer, mentor to at-risk teenagers, vegetable farmer, and was an editorial assistant at Norton in New York City. She now lives with her husband, daughter, and hound in the Gallatin Valley of Montana. This is her first book.